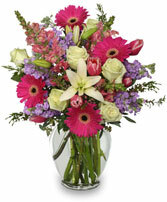 This stunning exotic flower arrangement in a decorative silver ceramic vase will whow any recipient! Ideal for making a statement - anniversary, thank-you gift or major birthday. 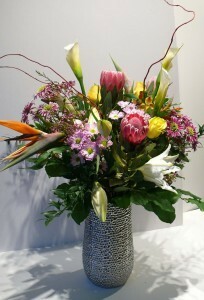 Tropical Flowers Such As Bird Of Paradise, Lilies, Proteas, Roses, Mums, Curly Willow And Seasonal Flowers May Include Orchids, Fill To Value, Decorative Large Silver Ceramic Vase. 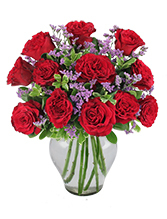 Ginger Jar Vase, Foliage: Variegated Pittosporum, Red Garden Roses, Purple Caspia. 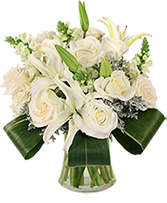 Gathering Vase, Foliage: Aspidistra, Dusty Miller, White Hydrangea, White Lilies, White Snapdragons, White Roses.